When everything was over on Friday night, or when it seemed at least a chapter of it was over, I was relieved turn off the TV, get away from Twitter and Facebook and shut out the noise. Even the voices of my friends were overwhelming as we moved out of the moment and into the processing of the story. Everyone had an opinion on the “right way” to work through what we knew. There were conflicts over gun control, Miranda rights, media coverage, the death penalty, and whatever else worked its way into our collective meaning making. I’m supposed to have opinions on all of these things. In truth, I have opinions on most of them, but am not convinced that those opinions matter one bit. I’m supposed to use these next few days to write a blog post or tweet that goes viral and states firmly exactly what one is supposed to believe about some element of the bombing and the search. Maybe I will do that at some point. But today I can’t. I can’t because I realize that even the people I disagree with are just trudging through the mess of the last week like I am. I realize that my opinions are not what give me value or purpose, and that my worth does not come from how many people think that I am right. I try to be guided by the light of Christ and the fire of the Holy Spirit burning inside of me. Sometimes, those things lead me to reach conclusions and forcefully proclaim them. I’m learning to be comfortable, though, with the times when all I can do is attempt to illumine rather than to know and share the answers. Last night my community welcomed six new members into full communion with the Catholic Church. Two of those people were being baptized, choosing to join our wacky family in their adulthood, being brave enough to witness to faith by receiving Christ’s light while we all looked on. 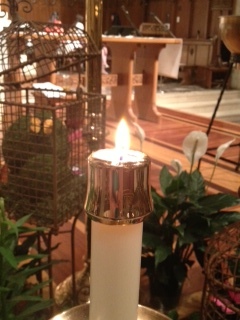 They were handed candles in our midst and were called to shine themselves. So as I struggle through my own confusion, my lack of eloquence and my awareness of insignificance, I look to the many lights both inside and outside of my heart. Sometimes it is enough just to burn and not to speak. When it feels I can do neither, there are more people out there bearing the same flame, who can also be my voice and my light.